New Renaissance 8 String Acoustic Guitar! Neck taper/thickness at the 1st fret: 13/16"
Neck taper/thickness at the 12th fret: 7/8"
Width of body at upper bout: 11 3/8"
Width of body at lower bout: 15 1/4"
By far, the best guitar I have ever played. I picked up the 8 string guitar a year ago or so, played 6's for 25 years. I was in the market for an acoustic version and this does not disappoint. Out of the box the set up was great. Nice, low action. Great feel. 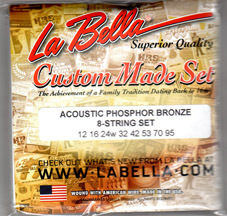 Excellent solid feel, fast neck, good looking, great sounding plugged in or acoustic. Couldn't be happier, had to write a review. I bought mine directly from the manufacturer. 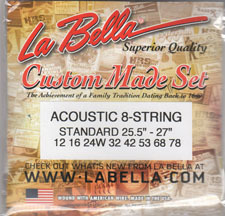 Get some strings for this, La Bella makes a custom set specifically for this guitar. The lowest string, might need some adjustment to get the intonation right (typical for extended range guitars). Compensating the saddle might help, if needed. For the price, just do it. Great instrument. All other 8 string acoustics I found are a minimum of $3,000. Question: What are the benefits of a pre-amp and 3 band equalizer? Answer: The pre-amp and 3 band equalizer give you access to certain frequencies that can help shape your sound on the move without going to your amp or pedal board. This is ideal for when you are playing live. They open a big range of tones and allow precise control while you boost your highs, mids, and lows.